End Couplings can be Either Galvanised Steel or Stainless Steel Rubber Bushes- Neoprene Rubber reinfoced Bolts & Nuts - SS304. C Max given for 1500 RPM applications. Longer lengths possible at reduced speeds. 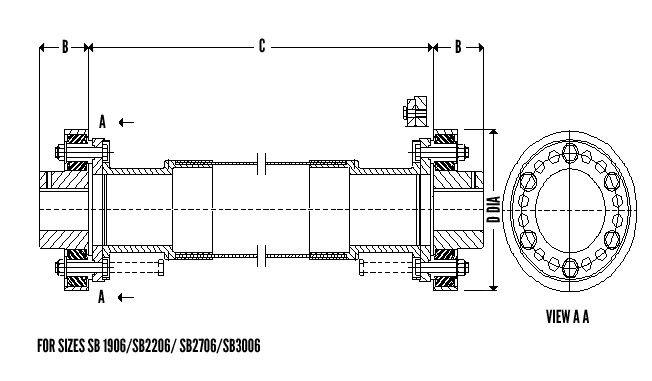 Max Misalignment 1 Degree per coupling Max offset parallel 60 mm for length of 3200 mm. Longer lengths can accommodate larger offsets. Dynamic Balancing to Gr 16 ISO 1940 - Assembly trim balanced at operating speed.